Dying and spinning: Lets see. On the fiber front I did some dying. I used some colors I hadn’t used before so it didn’t turn out quite like I was thinking but overall I am pretty happy with the colors. I am spinning it up for a laceweight to sell. The first batch consited of less than an ounce of merino/bamboo and the mini skein that I spun up of it and a small skein of mystery wool. It came out more pastel than I was hoping, but the second batch, which was about 3 ounces of the merino/bamboo, came out perfect. I am trying to get the picture to upload, but I can’t seem to get it to let me so I will post it l. Here’s a link to the Flickr photo instead. I didn’t seem to take a picture of the better colors, but I will take some tonight. What is great is the brighter and the pastel both blend nicely together. I am working on samples now to see how I want to ply it up for the best color. So far I have decided that a 2ply at the size the singles are is not acceptable for showing the color. I did a little Nplying but I just don’t know. I am going to try a traditional 3ply and see how it turns out. Even at a “3ply” Nply, it is still a heavier laceweight, I believe. I really need to double check that tonight. I just don’t feel like my Nplying is up to snuff, so I hesitate doing it right now. Ok. I really need to stop letting my emotions get the best of me. So I got my award letter from the college and for whatever reason did not notice that it was only for the Spring semester, not the entire year. This is because my hubby opened the letter and emailed me the results. I didn’t go back and read it thoroughly. Why should I? I only got half what I needed for school. Yup. Half. So half for half the year is? Yeah. Classic example of I shouldn’t let my emotions get the best of me and make sure I have all the information before getting down or upset, or heck, even happy! I got my letter on Friday. I was pretty well bummed most of the weekend, but decided that I was really going to hit this whole yarn thing really hard and get serious about selling online. Yes I understand that to actually make profit, it will take time and there will be ups and downs and blah blah blah. I know and despite all that (or maybe because of it, since my husband thinks I am O.D.D) I want to pursue it. Fiber makes me happy. We have discussed it in depth for about a year or so and we really want to open up an actual shop someday. Now understand that we are talking 10 years out, but it is still in the plans. We want to start selling online first, mostly handspun and hand-dyed fiber, but eventually also handmade spindles, stitch markers, project bags, maybe even handmade spinning wheels (that one is all my hubby!). We will be doing this starting with Etsy.com but hopefully will have our own website in about 5 years time. My Etsy shop is “up” but we (ok Hubby) is in the process of working on a banner and I am getting stuff ready for listing. Since I work a full time job and need time to, I don’t know, continue working on inventory, I am taking my time with this. I know I hate when I see a site under construction thing, but I will have items up no later than January 1. I really would like to do like a big Christmas thing. I am thinking about doing a gift with purchase. I still need to do some thinking on that one. I have so many ideas and so little time and resources for the next couple weeks. Spinning: I have had two really busy nights in a row, one grocery shopping and one watching a movie plus working late, so my spinning time has been short, maybe 15 minutes or less. I know. I know. For someone who wants to open a shop, that sure isn’t enough time, but I have had one of those weeks where there just isn’t the extra time. Even in this small amount of time I have had, I can’t seem to make it through this teeny tiny amount of fluff. I get that it is very wide roving so what looks small is acutally much, much larger, but still. I have said for two days, “I just want to make it through this little bit of fluff”. Still hasn’t happened. I think that my wheel is getting jealous. I completely understand, but I want about 4 ounces (or maybe 5) to be laceweight, and while I can spin laceweight on my wheel, it is a ton easier on the spindle. This is making the Matchless look even better. I really need to spin on one first though. I just can’t seem to get my wheels tension right to not fight for laceweight, for plied yarns. On the spindle I can get 23+ WPI on a 2 ply, and it is lovely. But it goes so much slower on the spindle. I want to order more roving so badly, but I think I may hold off a bit on that. Knitting: I haven’t had much time for knitting. The second (4th) Fog sleeve is about an inch or so long now. I should have knit last night while we were watching the movie, but I got caught up in looking over financial aid stuff that I didn’t I REALLY need to get this going because I want to have it finished before Christmas and I think I may rip back part of the other sleeve! I plan on doing nothing else tonight. Maybe someone else in the house will make dinner, so I can knit all evening. My plans for this weekend include dying and knitting. Nothing else, which means I probably won’t have time to dye or knit! LOL! Also on my knitting plate, I really want to knit the New Pea Coat from Interweave Knits Fall 2008. I wish I already had it knit now that I don’t know where my coat is from the move and it is starting to get cold! It probably will not be completed before the end of this winter. Actually I doubt it will be started before the end of this winter. And for the Ravelypics, I have joined Team Knitmore, and I will either be working on a project for me to wear to Stitches South (I haven’t picked what yet) or I may go with a pair of fair isle mittens (also no pattern yet). Kill me now! I just want to Dye! I had a pretty good weekend for the most part. Some fibery goodness, some hanging out with my hubby. We went to dinner on Friday and stayed up WAY too late watching Jurassic Park. Then Saturday we watched The Wizard of Oz. We now have a gym membership. This is really good since I went to the doctor today and she was very concerned about my blood pressure, and asked me in a concerned way about my thyroid. Got my shot and went on. My arm is sore now. I slept maybe 45 minutes last night. I couldn’t sleep. Nothing I did helped. I took a big nap yesterday because I had a headache. The headache came back last night only I couldn’t sleep. Oh. My dog has taken it upon herself to attempt to hunt the “mouse” in our bathroom. I can’t say for sure that it is an actual mouse, but I found droppings so that is what I think it is. She was up most of the night as well trying to get the mouse. I finally closed the bathroom door. Spinning: I couldn’t help myself with the title. Cheesy I know. But it is true. 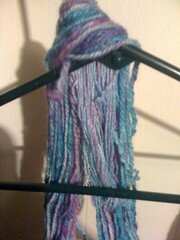 I am itching to dye up some of my roving. I don’t know what color(s). I just know it needs to be dyed. I need to purchase another pound (or 3) of the roving too. I am so completely in love with it. I plied some of it up on Saturday. Ended up being a lovely 2 ply and about 22 WPI. It wants to be a shawl. And 3 ply socks. It is soft and shiny and super lovely. My dog even likes it. She wanted to sniff it so I let her. 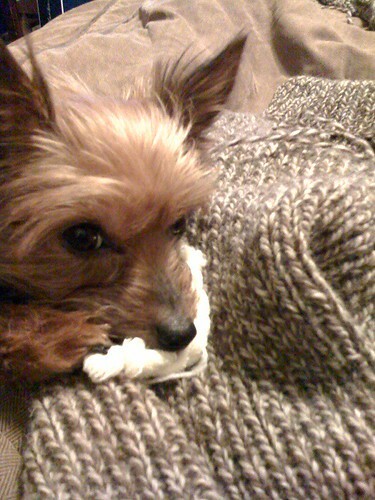 She took it from me and laid it down and stuck her little nose on it. It was so cute. I got the part for my wheel so it is fixed, but I am loving the fine yarn that I can do on the spindle. I can do fine on the wheel too, but it is more trouble. I definitely want to get the 21:1 bobbins for it. I think I am going to see if my hubby will let me order another pound of the Merino/bamboo blend and the bobbins. Knitting: I finished the sleeve. I am not happy with it, but it is done. I am kind of thinking about ripping back partway and work even all the way up. I think that there was just too much increasing. I may do that tonight actually now that I think of it. Then I can just figure out where it needs to be increased to and do that. Yeah. That is a good idea. It is amazing that I can have good ideas even though my brain is so sleepy right now. I can barely see straight! So I already have the second sleeve started and about 4 rows in. I will just run those off on a scrap yarn. While I was in the doctors office, I had my knitting. There was a really nice lady in there who, after watching me closely for about 10 minutes asked what I was making and how I got started knitting. She said she had tried her hand at it and decided she didn’t like it. To each his/her own (what was she crazy?!?!) She was interested in it though, just didn’t enjoy doing it. I suppose that is how I am about cooking. LOL! TGIF! Today has been a stressful week for me. Knitting: Well I got all of the increasing done! Woo! So after the increasing you are supposed to start working back and forth for like 2 inches. I need to do some measuring because I don’t think I need the whole 2 inches. I kind of hope not because I am getting close to the end of this ball of yarn. Of course when I finished the sleeve before I cut the yarn and then later frogged it, so I working with a sleeves worth of yarn and it is getting close! I have more and I am going to buy another skein anyway, so no worries, but still it makes me anxious to finish. It will be done tonight though! I am going to try to at least cast on for sleeve #2 tonight also so I can get that going. I have 21 days to finish the other sleeve, and hopefully crochet the blanket for my “nephew”. The sleeve is coming first since I promised it for Christmas last year. Spinning: Got out my spindle again last night. I am really trying to get better at spindle spinning. I don’t have a lot done, but I am going to try to ply for the first time this weekend (hopefully). I sent out a tweet last night and got some nice tips on plying on a single spindle. I was sitting here a little bit ago and realized that I don’t know if I spin on it clockwise or counter clockwise. I just do it and I can’t think of how I do it without the spindle in my hand. I want to say that the twist looks clockwise to me, but I can’t think of how I spin the darn thing. I will be investigating that tonight. It would really helpful to know before I try to ply! LOL! I also would like to weigh my spindle. In 2006 I went on a knitting retreat and they did a drop spindle class. We paid however much and we got to keep the spindle and the wool that we worked on. I know nothing about it other than it is wood. That was also when I decided I wanted a wheel, because the whole start-stop-wind-start-stop-wind got on my nerves. I wanted something that I didn’t have to stop every minute or whatever to wind. That is still my biggest problem with spindle spinning now and why I don’t do it very often. Also why I am not so good at it. Anyway I want to get better. I love that I can stick it in my purse and take it just about anywhere. Of course there are places that I would never spin. Fiber goes everywhere, so never around food, and no place with open top glasses. Straws and lids are ok. I just don’t want someone to start complaining about fiber in their stuff. At my house I don’t care, just pick it out! Well, I am almost finished with the back of The Fog sweater. This picture is actually not very recent. I took it earlier this week when I had just started the back. I have just a couple inches left to go and I am hoping to have it (the back) finished tonight. Then all I will have is the front, sleeves, and neck. I am thinking mock turtle, but DH doesn’t have any problems with a full turtle, so we will see. Anyway with just those little bits left and most of a weekend to work on it, I will hopefully have it done by next Thursday. That is my goal. If I can get it done then, it will be within this month (I know I probably won’t be knitting on Halloween so it has to be done Thursday) and DH will be VERY happy. In spinning news, I have been spinning a little bit again. I haven’t hardly touched my wheel in forever. I think that I may actually be getting the hang of it. Still trying to understand the whole drop spindle thing. Not quite getting the hang of it (ha! Hang. Get it? Drop spindles hang? I crack myself up!). I even bought a subscription today for Spin Off magazine. I would like to get more into spinning, just not real sure if I am doing it correct most of the time. I guess that is a good goal for the remainder of the year. Just learn to spin. Of course AFTER DH’s sweater is finished! Let’s see. Other areas of my life… I am looking for a part time job in the evenings/Saturdays for some extra dough. DH and I are going to Georgia in December 25 or 26 to see his family for a long weekend! I am just a little worried about money. Plus I have a doctors visit in December that will more than likely all be out of pocket. $107.01 for my shot and then who knows how much for the procedure. Have I mentioned that I hate going to the doctor? I was sick for a month just recently and finally broke down and shelled out $69 because I had bronchitis. Ug. Plus $18 for Amoxicillin and some really fun cough syrup. Good thing is, I am feeling much better now. Yay. I am hoping to start going back to school next fall. I am thinking seriously about getting a degree in Apparel Studies. I am weighing my options before I commit though. I just don’t know. There are so many things that I would like to do and I just don’t know if I can do them. I know that probably sounds dumb. I know. I know. You can do anything you put your mind to. That is just the problem. I don’t know if I will enjoy it and I don’t know if I will do anything with it if I do it. Of course I would love to own my own yarn shop someday, but that will probably never happen and even if it did, I am pretty sure that a degree in apparel studies will only help me so much. However DH works for a testing company that has a branch for textiles and IF I were to get the degree, I might be able to get on there and use the degree. Not completely sure, but whatever. Honestly I really like my job that I have right now (most of the time LOL!) and I don’t have any plans anytime soon of leaving. I just don’t know. I want to do so many things with my life, and life is so short, that it is hard to plan accordingly. Speaking of life being cut short. Very dear friends of our family were killed this weekend in a motorcycle accident. http://www.legacy.com/palestineherald/Obituaries.asp?Page=Lifestory&PersonId=119185094 Mr. James and Miss Gwen have been there as far as I can remember. We have known them since I was 2. I was at their house all the time. I remember Miss Gwen taking me to the park that was near the house. I remember when the screened in porch was added. I have so many memories from there with them. They were the kind of people that make such a huge impact on your life. People that you will never forget. It was such a tragedy to see them go, but at least they went together.